TIME STORIES is a journal, a twinkling toe in the stream of moments that illuminate my music at the turn of the millennium. Here are some of the musicians that I¹ve enjoyed playing with in the last five years. I¹ve shared many hours with them ­ before, during, and after the gigs. 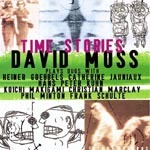 TIME STORIES brings together seven musical relationships, seven sets of memories, some going back to 1979. TIME STORIES also continues my long research into the duo form. I¹ve always thought that the duo is the most challenging and rewarding situation: every movement, each sound and silence is critical and influential; any moment can suddenly become a solo, and any solo can suddenly be supported or surprised. At its best, the duo form constantly shows me that I can¹t really control anything ­ I just play my best and laugh with the unexpected pleasures that my partners plunge me into!